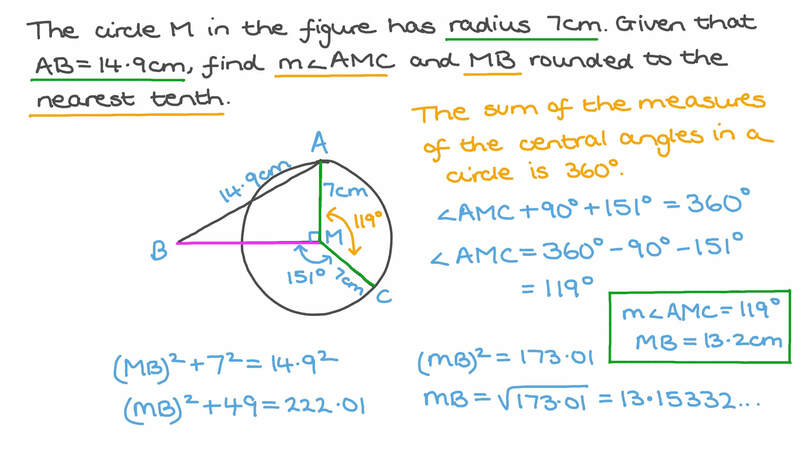 In this lesson, we will learn how to identify central angles and how to find their measures using their portion of the circle and their sum. In the given figure, the circle has center 𝑀 and radius 7 cm. Given that 𝐴 𝐵 = 1 4 . 9 c m , find 𝑀 𝐵 , rounded to the nearest tenth, and 𝑚 ∠ 𝐴 𝑀 𝐶 . How many 1 ∘ angles are in a circle? How many turns are needed to make a complete turn? How many angles does it take to make a full turn? Bassem turns one-third of a full turn. How many degrees is this? This circle is divided into 3 equal parts. What is the angle of each part? What is the value of the central angle of a circular sector when a circular segment and a circular sector have the same area? Find 𝑚 ∠ 𝐴 𝑀 𝐵 .
𝐴 , 𝐵 , and 𝐷 are three points on a circle with radius 54 cm and center 𝑀 . The point 𝐶 is the intersection of 𝑀 𝐷 and 𝐴 𝐵 and we have 𝑀 𝐶 ⟂ 𝐴 𝐵 and 𝑀 𝐶 = 4 2 c m . Find the central angle of the major circular segment 𝐴 𝐹 𝐵 giving the answer to the nearest second. A circle has a circumference of 1 6 𝜋 units. Find, in degrees, the measure of the central angle of an arc with a length of 3 𝜋 units. In the figure, given that the circumference is 96 and 𝐴 𝐵 = 1 2 , find 𝜃 . What is the size of half a circle? Circle 𝑀 has radius 32 and 𝐴 𝐵 = 5 6 . 5 . Determine 𝑚 ∠ 𝐷 𝑀 𝑋 and 𝐷 𝐸 to the nearest hundredth. In the given figure, the circle has center 𝑀 and radius 9.9 cm. Given that 𝐴 𝐵 = 1 7 . 1 c m , find 𝑀 𝐵 , rounded to the nearest tenth, and 𝑚 ∠ 𝐴 𝑀 𝐶 . In the given figure, the circle has center 𝑀 and radius 8.5 cm. Given that 𝐴 𝐵 = 1 6 . 5 c m , find 𝑀 𝐵 , rounded to the nearest tenth, and 𝑚 ∠ 𝐴 𝑀 𝐶 .